In business, it is often easy to be overwhelmed with all the “to do’s” and checklists, the never ending items that not only need to be attended to, but also done well, and measured and reported. For businesses that are struggling, the daily stresses are magnified and the list of problems can seem overwhelming. In the last few months retail businesses are simply struggling to survive, especially against a backdrop of digital disruption and the all-to-common store closings from small shops, to even the big boy brands, with Macy’s recently announcing 100 closings. So how to do you transform and turn around an organization that might be deficient in multiple areas? How do you know where to start? How do you direct your employees to tell them where to start? 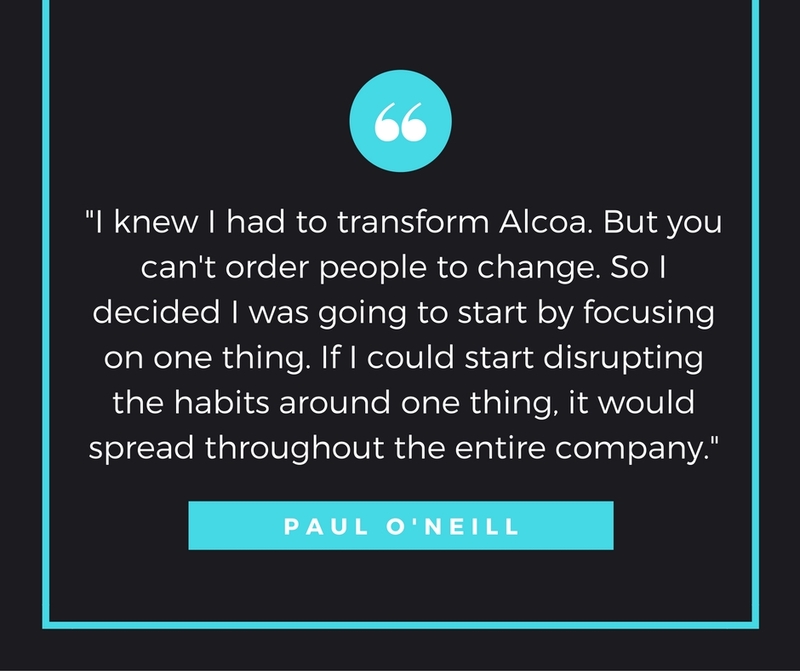 In the New York Times best-seller, Power of Habit, one of the stories presented was how an untested CEO, Paul O’Neill was brought in to turn around Alcoa, a huge, albeit struggling aluminum manufacturing company. After evaluating the company, O’Neill could have made sweeping changes from manufacturing, to sales,marketing, etc. Instead, he decided to focus on one area. Worker safety. Investors hated the idea, workers and employees who were expecting bigger changes reacted similarly. But by simply choosing a starting point, and focusing on one thing and making it great, he transformed a company. Worker safety went from 1.86 lost work days to injury, to .125 in 2012. The unintended consequences of that decision, helped transform the way they did business, they discovered a more efficient and safer process to manufacture aluminum and it made all the difference. One year after O’Neill took the job, the company hit record profits and did so for the following 13 years O’Neill was there. Can You Quantify a Smile? Most recently, McDonald’s had a similar discovery in the most unlikely of places, Russia, and in the most unlikely of ways. Smiling….yep smiling. I’m not sure the the words “Russia”and “smiling” and “McDonalds” have ever been synonymous with each other, but hear me out. According to the “Smiling Report” (yes, srsly…that’s what it’s called!) compiled by Better Business Worldwide, from more than 1 million mystery shopper evaluations found that 90% of Russian retail workers smile, even out distancing the USA workers at 87%. Ok, great, Russian retail workers smile…big deal. How does that translate into sales or anything? Good question. When they first conducted the test back when McDonald’s was just opening, one of the biggest challenges was getting employees to simply smile. It wasn’t a big part of their culture and the initial study the Russians had the lowest total at 45%. Now that the employees have bought into smiling, they started to see repeat customers and they’ve learned that friendlier employees are the actual reason for the boost in sales. Some customers even mentioned that because there are so few friendly places in Russia. So instead of constantly worrying about every problem you have, pick one and go. At the same time, wouldn’t it be great to be able to pick a certain tactic or area to start that you know would transform or bring the biggest financial impact? Hmmm…. Mike Jensen is the Director of Content Marketing and Social Media for Cambeo. He's previously worked on Blendtec's famous "Will it Blend?" YouTube channel and successfully marketed products such as New York Times Best-seller, "The Romney Family Table" by Ann Romney, NBA Hall-of-Famer John Stockton's autobiography, and Gladys Knight albums. In his spare time he enjoys eating cold cereal late at night, terrorizing his wife and 5 children with 80s music, and a nice cold Vanilla Coke.